Between Grove St. and Davis St.
We can provide our delicious meals at your next event. When you want delicious, home cooked Italian cuisine, Trattoria Demi is the place to be. We use high quality ingredients in our preparation to make fantastic cuisine for our diners. Everything we make is fresh to order, so you know that each bite will be full of flavor! 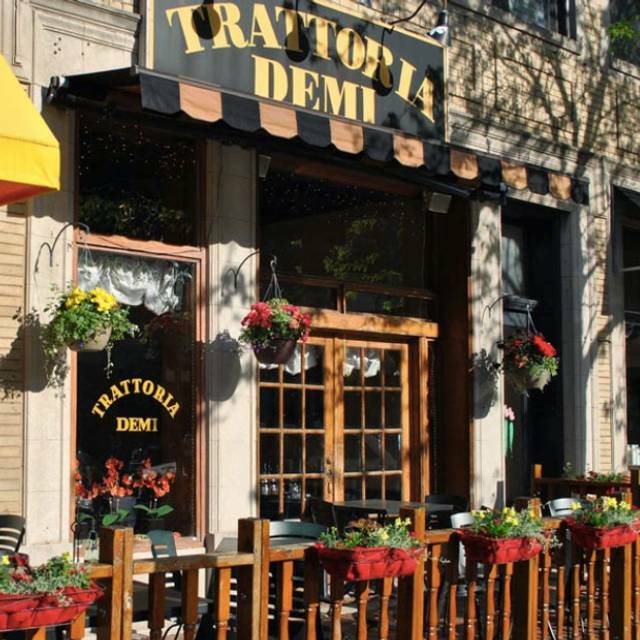 Trattoria Demi has been a local favorite for over two decades. Eating here is like going to a small Trattoria in Sicily. Order the Italian classic Linguine Marinara with Meatballs, and you will find this to be true. The sauce is home made daily and the meatballs have a loyal following! Every dish is made fresh to order so special dietary requests are easily accommodated. Gluten free, vegetarian and vegan options available. At Trattoria Demi, patrons will always find an extensive wine collection to complement their dinner choices. Whether it is for a quick bite for lunch or a family gathering in the evening, this is the place to go for tasty Italian food. 3 adults went for an early Saturday lunch. Reservation were not necessary. All food selections were delicious and nicely presented. Will definitely return. Farfalle with salmon was outstanding & large enough for me to take home half for a second dinner. My husband & son each had their own pizzas, which they report were very good. Crust is not super thin but crispy, not a preferred crust for my husband. Service was top notch. We had a lovely dining experience,staff hopeful & cheerful, entrees tastily delicious, enjoyed the ambience of a smaller restaurant . The food was excellent. The waitress was borderline rude, but the gentleman who filled our water and cleared our plates was very nice. House red was low quality. Because there were empty tables, it wasn’t loud but I’m sure if the restaurant had been full it would have been loud. This is my new-found favorite in Evanston. The veal scallopini, chicken parmesan, and spaghetti and meatballs were delicious--amazing renditions of classics. The children's menu offers a variety of tempting options. Service was efficient. I will return soon to try one of the fish options. Nice cozy and welcoming! Had a great experience here. Food and service were wonderful! Good value too! Best Italian food I have had in a long long time. Everything in the menu is worth trying! They did not have our table set or even knew about the reservation when we walked in. Kind of a unique or odd entry. You actually enter directly into the dining room where we were not greeted by anyone. The decor just feels old and the food was just average. We were disappointed with our meals! The appetizers were uninspired, and the meats were overcooked. Perhaps they were having an off night, but this fell far short of expectations. The service was a little slow But the food made up for it the Cioppino was the best I’ve ever had. A wonderful restaurant! Great food, lovely environment, and wonderful service! As always, creative offerings and yum! Normally I have had a good experience here but his time the owner ignored us for a long time as she sat with other guests talking. I convinced my family to go there after seeing La Boehme touting the restaurant and then was embarrassed at the poor service. Love the atmosphere in this intimate restaurant. Service is friendly and prompt and menu has great selection of pastas and other Italian fare. Good service. Food was as expected. Very quiet and perfect for a larger group. We could hear at both ends of an eight person table! We love dining here. Wonderful creative menu. Wonderful place for a laid back birthday dinner. Good food, friendly staff, and nice ambiance. Nothing too fancy but great quality food! A favorite of ours for many years. Always great food and service. Very nice atmosphere. Small quiet dining room. Just please heat the restrooms! Trattoria Demi is our go-to Italian restaurant when we just want a good meal in a conversation-friendly atmosphere. Just a nice, intimate restaurant. The food is consistently good and the wine list is better than I would expect for such a small place and is reasonably priced. We've been here a number of times, and will go again. Cute & charming little restaurant. Was our first visit. They seemed to be short of servers as we had a long wait for service & had to actually ask someone to please wait on us after about 20 minutes as we had an event to get to. We arrived at 6 & barely made it to our event at 8pm nearby. Food was good, but not exceptional. Skimpy on vegetables & meats in my & my husband’s pasta dishes . House wine was good, Small servings for the price. We had a very nice meal. Everyone with the exception of my husband enjoyed their dishes. I ordered the Rigatoni & Ricotta with Gluten free noodles. It was delicious! I hear that the Shrimp Scampi and baked Rigatoni were really good as well. My husband ordered the Salmon on the menu and felt that it was very bland. So he kept eating my dish. Also, they serve my favorite Moscato wine Saracco, so that was a bonus. I'd definitely be back!! First time there, great food, we will definitely go back again. Reliable good food and friendly service. A neighborhood gem. Great place. Food delicious and not pretentious. Will definitely go back. Trattoria Demi is a relaxed spot with good food. I think meatballs and marinara sauce are the measure of an Italian restaurant. They pass with flying color. We'll go back. Casual sit down restaurant with a large menu for a small restaurant. Easy to find something for everyone. Goat cheese appetizer was a hit for all. Gnocchi and volcano chocolate cake were Excellent, lasagna and buschetta were not very good. Just awful. Aweful service! Aweful food! I don’t think there is a better word for this place! Tratoria Aweful!!! We enjoy a visit when in town every couple of months. Food always good. This visit was an extremely busy night with 2 large groups which made dining tough in a small space. Staff seemed very stressed and spread very thin that particular evening waiting on customers. Large groups took away from the ambiance of the restaurant and left little time for staff to wait on smaller table settings. Just was not the best night, but will not stop us from coming back! We were visiting the area and looked for a great Italian restaurant. We found one. The food was terrific. It’s a bit loud and crowded, but the food quality and quantity was excellent. Food is outstanding. Decor is nothing to write home about. Service is a bit rushed. Pasta dishes are delicious, many options for vegetarians and meat eaters. Lamb shank and salmon dinners were praised. Salads are fresh, appetizers offer variety if not much dazzle. Wine selection is small, made worse when two choices are not available. And no cappuccino is hard to understand. Service was very good, especially when one waiter was caring solo for a full restaurant! Agree with many other diners—hire sufficient staff to manage the place well, not just barely. We opened our leftovers tonight to find somebody’s salad, not the rest of our tasty salmon. Haste made waste. That mess aside, this is a recommended cozy and friendly place! Good food, indoor or outdoor dining. Very enjoyable. We have returned to this small restaurant year after for consistently good food in a casual setting. In the summer we dine outside on the patio and in the winter we enjoy the warmth indoors. The choices of Italian dishes and are always great and we enjoy the relaxed atmosphere and sufficient quiet to conduct conversation with our meal. Add a glass of wine and you have it all!